The Free Map Tools User Menu is an addition to the Free Map Tools website intended to allow user-specific work to be saved, reloaded and shared between different pages on Free Map Tools. All actions are user specific. Nothing you do is available to other users unless you decide to share the XML export file. All data is stored on your local machine. There is no server storage. Persistent data can be kept in the form of an XML file that you download, retain and upload at a later date. You hold your data. There are no logins, signups or passwords. We don't know who you are! About User Menu This page! The Settings option inside the User Menu can be used to change the appearance of the markers on the map. 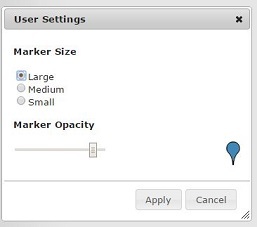 You can adjust the size of the markers by selecting Large, Medium or Small. You can also change the opacity of the marker using the slider. A preview marker is displayed on the Settings window. Once you have the correct settings, click Apply. If you do not want to make any changes, click Cancel. 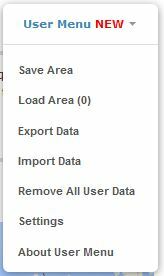 A table to highlight the options for saving and loading areas, radius and routes on pages on Free Map Tools. Generally you should be aiming to save on one page load the save 'type' on the same or another page. Please contact us to highlight any bugs or suggest changes to the User Menu. How can I print the map with the radius that I have created? How accurate is this for Canadian cities? What is the source for population? What year is the census from? Thanks! What are the populations based on? Sources? Thanks for the feedback. We will review these and look to make improvements. The language of place names changes depending on the location. Where abouts are you looking? How do I get English names on the map??? Hi, which page are you on? What this the URL? how do I print only the marked map? Hi Roger, just to check ... so you can see 1 or more saved routes on the saved routes list in the user menu? Do I have to register to recover a saved route? I can't see how to use your website! I've saved a route but now can't see how to recover it! Great tool, saved my S trying to figure the locations contained within 7.5 and 10 miles radii around the wife's office. Charles, I'm not 100% sure what you mean. Can you explain in more detail please?